Bondi Pizza was established in 2009 in pursuit of "the tastiest Thin Pressed Pizza in the world". The Bondi Beach restaurant is set right on Campbell Road, directly opposite Sydney's stunning Bondi Beach and is a great place to catch up with friends, cool down with an icy drink, and fill up on delicious thin pressed pizza. My sister and I visited Bondi Pizza on Bondi Beach on a sunny Sunday afternoon. We grabbed a table in the outdoor seating area and settled in for a few hours of people watching as the eclectic Bondi crowd passed us by. Bondi Pizza is also pretty child-friendly, so feel free to bring the kids in and tickle their tastebuds with gourmet pizza (but be careful, they may not want to go back to Pizza Hut after this!). There's also a special Kid's Menu so you're sure to find something that the kids will enjoy. Bondi Junction: Shop 6009, Level 6, Bondi Junction Westfield. For more information, check out the Bondi Pizza website. The Bondi Pizza menu is pretty standard for a pizza joint, offering tasty morsels like Sizzling Chilli Prawns, Marinated Meatballs, Stuffed Grilled Mushrooms and Tomato and Mozzarella Bruschetta, just to name a few. The Meatballs are worth a try - this will sound strange but they do actually 'melt in your mouth'. We also shared the Salt and Pepper Calamari and while it was pretty tasty, especially when coated in the lime aioli, there wasn't really much 'salt and pepper' to it. Given this is a pizza joint, you'd expect a good range of pizzas to choose from and Bondi Pizza does not disappoint on that front. There is a wide range of signature pizzas including Grilled Chicken Pancetta, Grilled Chilli Prawn, Marinated Chargrilled Lamb, Spicy Chilli Mexican Nacho, and Spinach Pancetta, just to name a few. Bondi Pizza also offers the classic Margarita, Pepperoni and Ham and (caramelised) Pineapple. My sister and I chose to share the Bondi Meat Supreme and were very happy with our choice. The toppings looked and tasted fresh and there was plenty there, the pizza sauce was yummy, the crust was thin and crispy, and the combination of all these made for a very satisfying meal indeed. One pizza is enough for two people to have three slices each, so perfect for sharing. If you're extra hungry, Bondi FM also serves up large plates of gourmet salads and pasta. I've got a very sweet tooth and can never walk away without dabbling in some dessert. Unfortunately, we were too stuffed from our pizza to try one of the dessert pizzas, which include the Oven-baked Apple Crumble Dessert Pizzette, Oven-baked Banana and Chocolate Dessert Pizzette, Oven-baked Rocky Road Dessert Pizzette or the Oven-baked Chocolate Filled Pocket. 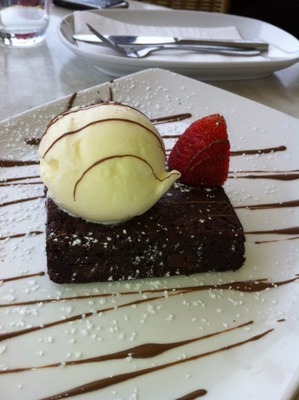 We ended up opting for the Triple Chocolate Brownie with melted Belgian Chocolate. The brownie isn't baked by Bondi Pizza, but it was still very moist, very chocolatey and oozed of warm melted chocolate bits. I was a little disappointed with the 'melted Belgian Chocolate' as that ended up just being a few drizzles on the plate and was more like a garnish. Bondi Pizza offers a wide range of signature cocktails. I am pretty partial to lychees so was very happy to spot the frozen Icy Lychini, perfect for a sweet tooth on a hot day. 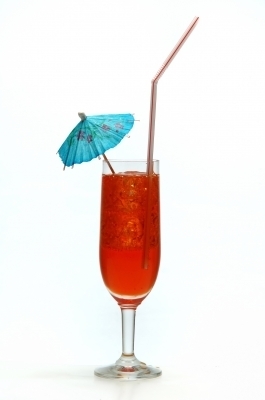 The Raspberry Debonair is another frozen cocktail for a quick cool-down after the beach. Both the Icy Lychini and Raspberry Debonair also come in an icy shot. Other more standard cocktails include the Mojito, Caipiroska, Cosmopolitan, Margarita and Apple Martini. There is also a good selection of local and imported beers, wines, spirits and the standard non-alcoholic soft drinks and bottled juices.